Blessed Brigida of Jesus’ spirituality, born of a profound God consciousness, draws inspiration from the Ignatian spirituality, being ‘contemplative in action’. She is always portrayed holding a Crucifix in her hand; in her exhortations to her daughters she never failed to recommend contemplation of Jesus Crucified as the basic characteristic of our spirituality. She used to say: “ Let the Crucifix we wear be our mirror so that we may conform our life to that of Jesus our guide and model!” Hers was a Christ-centered spirituality and she desired that each Ursuline be deeply in love with Jesus Crucified, which would enable her to love all the people she encountered, especially the poor and the suffering members of society. The Foundress wanted her daughters to be “women of prayer”, living in constant awareness of God’s presence, as true servants of Him, fully dedicated to Him in meekness, humility and interior joy, ready to accept suffering and sacrifice for the sake of the Kingdom. Blessed Brigida loved Mary, the Immaculate Mother of God, with tenderness. She venerated Her and instilled in her daughters the truth that Mary is the most faithful follower of Her Son, Jesus. Loving and imitating Her, is the shortest way to holiness. (Ad Jesum per Maria - to Jesus through Mary) Constant union with God would be possible by devotion to the Eucharist, to the Word of God, wholly abandoned to His Providence. Such was the spirituality of Brigida who, with filial devotion, could exclaim: “Confidence, Confidence! A large heart! God is a Father and He will never abandon us!”. 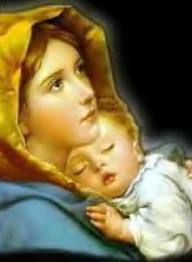 Ursuline Anthem Mary, Mother of God, Immaculate Mother of God, We see in you the pattern, of our mission and our life. God’s will was your search; God’s will was your joy, Our joy also shall be in surrender to His will. Give us a heart like yours, a heart that always loves A heart that’s never hardened, a humble, noble heart. A heart that lives for Jesus, and all for whom Jesus loves, A heart whose sole desire is fixed on loving as Jesus loves. Text and music by Fr. J.B. Fernandez, S.J.